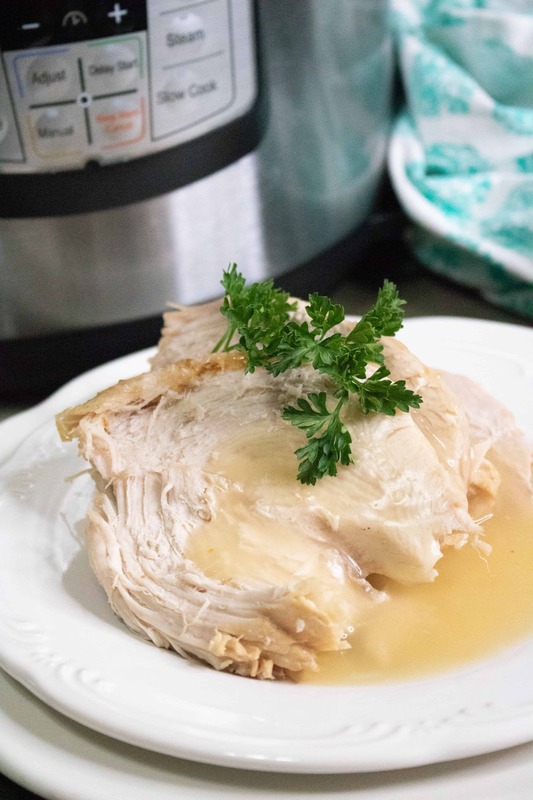 This recipe for Instant Pot Turkey gives you a delicious, moist and juicy whole turkey that is ready to serve in less than 1 hour! As soon as fall arrives I start to think about the Thanksgiving meal. Menu planning, researching recipes, designing my table decor, I love it all! But the one thing that can put a damper on the festivities and strike fear in even the most experienced cooks is making the Thanksgiving turkey. Luckily, Instant Pot Turkey eliminates all the worry ( and all the work). It is so simple and so easy, you’ll want to cook this easy Thanksgiving turkey recipe all year long! It is so fast! It may be hard to believe you can have a fully cooked turkey in less than 1 hour, but it’s true! Thanks to the wonder that is the Instant Pot, you can forget getting up at the crack of dawn to get the turkey in the oven. 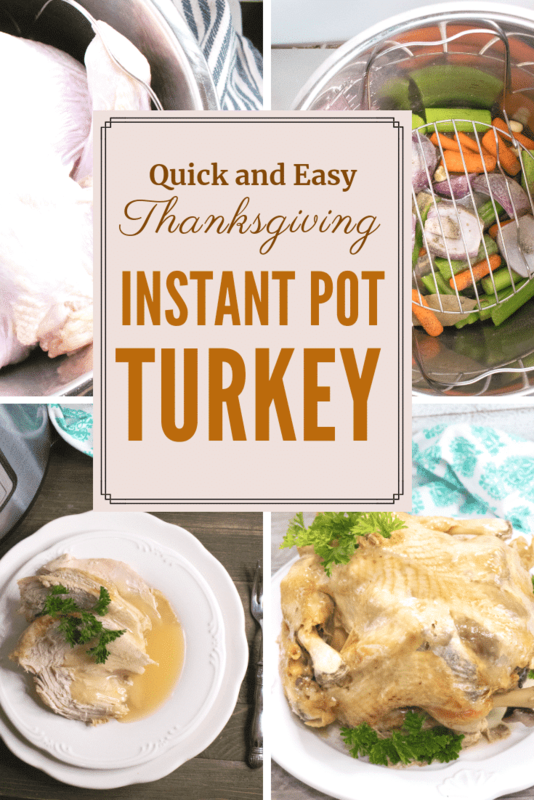 Instant Pot Turkey lets you free up that precious oven space, which is always in high demand on Thanksgiving day. You can just set it and then forget it! No basting, no constant checking, no tenting the turkey with foil. Since the Instant Pot does all the work, you can simply kick back and relax. 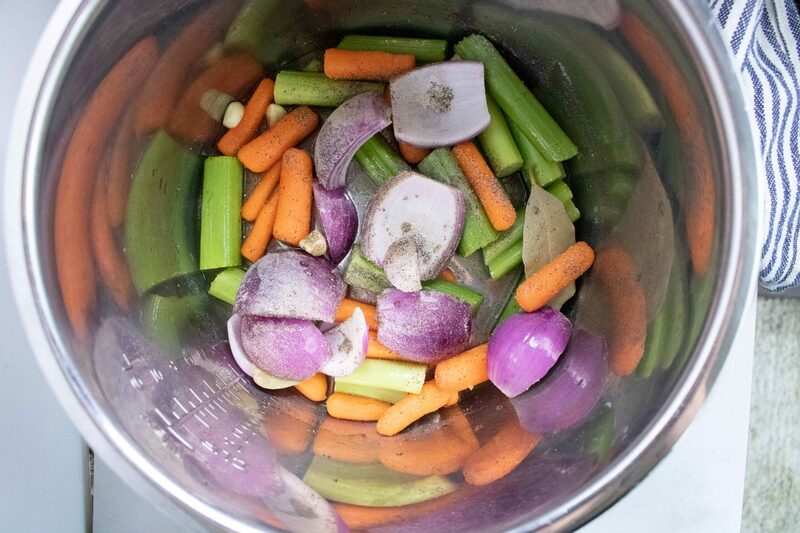 Step #1: Add water, celery, carrots, onion and garlic cloves to the Instant Pot inner pot. Step #2: Next, place a trivet rack on top of vegetables in the Instant Pot. Step #3: Set the turkey on top of the trivet rack, close the instant pot lid and turn pressure valve to seal. Then cook on manual high pressure for 6 minutes PER POUND. For an 8 pound turkey like the one shown here, set the cook time to 48 minutes. Step #4: Allow for a natural pressure for 10 minutes, and then let out the remaining pressure. If desired, transfer to broiler pan and broil for 2-3 minutes or until golden brown on top. Then serve and enjoy! 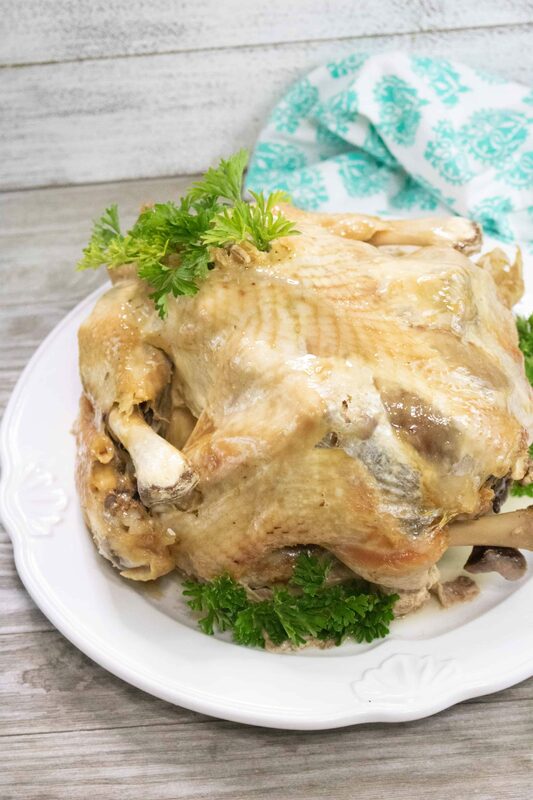 With this Instant Pot Turkey recipe, you can cook a deliciously moist and juicy whole Turkey in less than 1 hour! Add water, celery, carrots, onion and garlic cloves to Instant Pot inner pot. 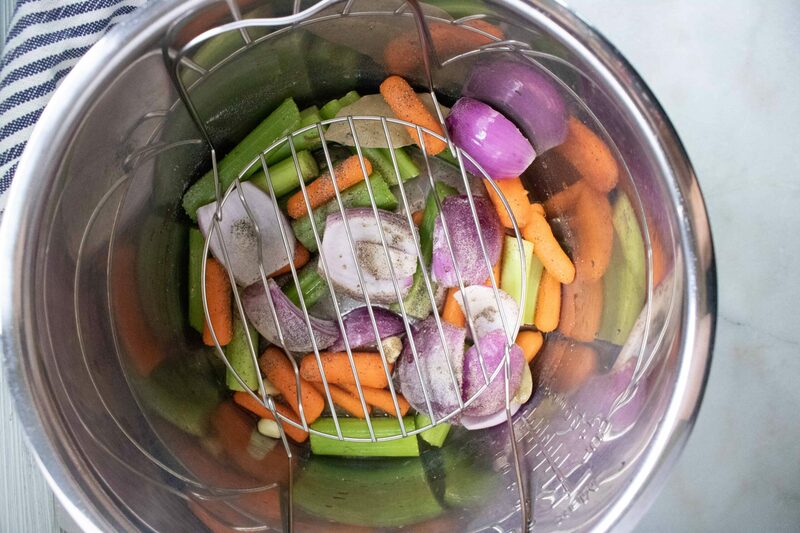 Place trivet rack on top of vegetables in the Instant Pot. 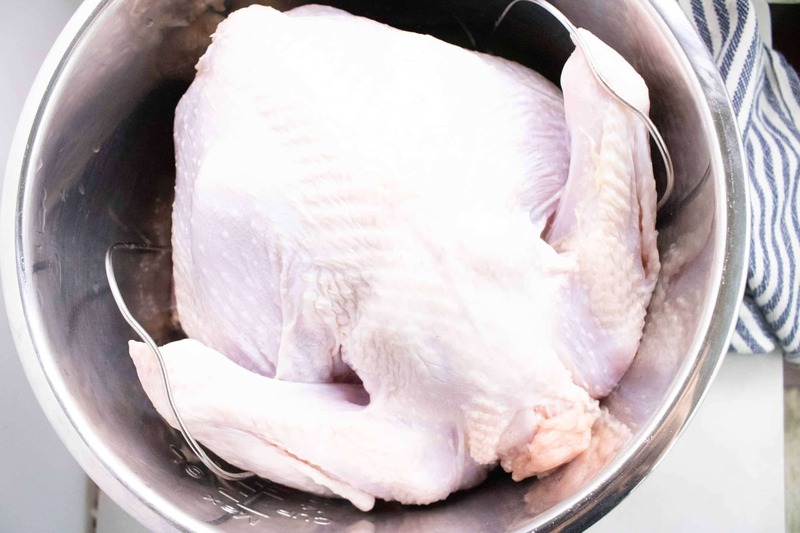 Set the turkey on top of the trivet rack, close the instant pot lid, and turn pressure valve to seal. Cook on manual high pressure for 6 minutes PER POUND. For an 8 pound turkey, like the one shown here, set the cook time to 48 minutes. Allow for a natural pressure for 10 minutes, and then let out the remaining pressure. If desired, transfer to broiler pan and broil for 2-3 minutes or until golden brown on top.